Air pollution appears as “a major public health issue and not just an environmental concern” that electric car ownership mitigates, according to Michael Boxwell, author of The Electric Car Guide 2015 Edition. The 49 pages of text that comprise the book’s 10th chapter on “Electric Cars and the Environment” bring together information relevant to European and world experiences. Public Health England, executive agency of the United Kingdom’s Department of Health, considers that “air pollution is responsible for 5.3% of all deaths in the over-25s.” World Health Organization Fact Sheet No. 313 describes household and outdoor air pollution as respectively attributable to 4.3 million and 3.7 million premature deaths in 2012. André Nel, Professor of Medicine at the University of California, Los Angeles, estimates tens of millions of complaints of pollution-prompted heart and lung-related diseases in 2005. The world's two all-time, best selling all-electric cars are Nissan Leaf (left), with over 192,000 global sales through September 2015, and Tesla Model S (right), with over 90,000 by October 2015. Vehicle exhaust fills the air worldwide with particulate matter, also called particulates, such as carbon monoxide, nitrogen oxides, toxic organic micro pollutants and volatile organic compounds. The tiny particles go straight for the bloodstream and the lungs so that chest pains, coughs, internal organ damage, shortness of breath and throat irritation ensue. Toxic organic micro pollutants produced from incompletely burned fuels have a range of effects, from cancer to internal organ damage, interrupted child development and reduced immunity. Carbon monoxide inhibits oxygen deliveries to connective tissue and internal organs while ozone, product of nitrogen oxide, sunlight and volatile organic compounds, leaves everyone ultimately breathless. Emission levels jump downward with electric car ownership even though fuel origins, performances, quality and releases behind generation of electricity may have pit-to-plug and well-to-wheel implications. The 120-MWe (megawatt electrical) Nesjavellir Geothermal Power Station (NGPS) in southwest Iceland is the Nordic island country's second largest geothermal power station. Hydroelectric, solar and wind turbine power stations keep air pollution levels low since they do not emit carbon dioxide, carbon monoxide, nitrogen oxide and sulphur dioxide. Iceland leads in pioneering geothermal energy extracted from hot water surface pools and volcanoes formed by the meeting of the Eurasian and North American tectonic plates. Geothermal power stations minimize carbon dioxide emissions and release no carbon dioxide even though they emit trace amounts of ammonia, arsenic, hydrogen sulphide, mercury and methane. Nuclear power stations need to be monitored for radioactive waste even though they release no pollutants other than carbon dioxide, at lower levels than geothermal stations. Gas-fired stations offer about one-half and one-third of coal-fired and of oil-fired station-released carbon dioxide, carbon monoxide and nitrogen oxide emissions, and traces of sulphur dioxide. Eco-technology author Michael Boxwell specializes in writing about electric cars. Battery charge-ups overnight, non-existent point-of-use pollution, recyclable vehicle parts and renewable power innovations put electric car ownership, not conventional car operation, alongside environmental and public health. Governments and manufacturers quantify the compatibility as 60 percent shifts to electric cars by 2050 and 20 percent increases in electricity consumption with 100 percent shifts. Scientific advances and technological breakthroughs respond to such environmental and public health challenges as Fukushima meltdowns, mountaintop removal coal mining and shale oil production-facilitated earthquake incidence. They suggest that conventional car ownership and non-renewable power sources remain competitive until coal, gas and oil exhaustion predictions are realized and nuclear-powered stations are decommissioned. Michael Boxwell, respected expert on renewable energy sources, thinks that solar- and wind-powered electricity-generating stations advance electric car ownership and assuage environmental and public health concerns. “Ambient (Outdoor) Air Quality and Health.” World Health Organization > Media Centre > Fact Sheets > Fact Sheet N°313 Updated March 2014. Boxwell, Michael. 2015. 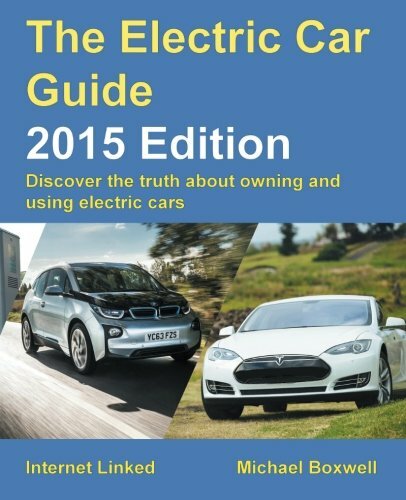 The Electric Car Guide 2015 Edition: Discover the Truth about Owning and Using Electric Cars. Coventry, England, UK: Greenstream Publishing Limited. Nel, André. 2005. “Air Pollution-Related Illness: Effects of Particles.” Science Volume 308, Issue 5723, Pages 804 – 806. Over 200 pages of information on electric car ownership. *Extensive directory listing every make and model available today. *Find out about the latest electric car technology and what is coming next. CruiseReady, Alternative power sources, such as electricity and steam, lost out to gas-driven cars because of the early twentieth century's oil booms memorialized in such films as There Will Be Blood. They're catching up for lost time now, particularly under the influence of such committed developers as Elon Musk. It's good that they are now developing the range that an electric car can go on a single charge. it's something that must happen before many could even consider them. sandyspider, It's interesting that electric cars may have been eclipsed after the beginning years of the twentieth century even though their appeal never vanished. Their early models and those of the Stanley Steamers interest and intrigue me. We need to protect the environment. Good to learn more about the electric cars. The April 2016 issue of Popular Mechanics covers the EHang 184 as personal transportation in flying cars, a prediction in the magazine’s April 1906 issue.